This was taken last year during the "girl's cruise," an annual tradition of taking three of my wife's longtime friends out for a sail on Pamlico Sound near our home port of Oriental, North Carolina. This is my favorite. It shows a couple of the "girls" (actually they are retired school teachers) lounging on the cabintop. The hardest work that day was keeping the wine glasses filled. The cover of the album was painted by Jack Ketner. 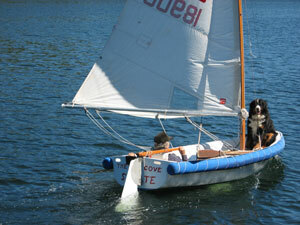 It includes another good old boat we owned in the 1980s, a Mariner 36 ketch. As is often the case, there's more to the story, but that's enough for now. Chris and Kellee Nolan are a couple of U.S. Coast Guard officers taking a two-year sabbatical currently in the eastern Caribbean. 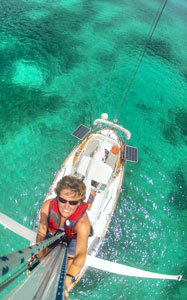 Kellee took this shot while up the mast. 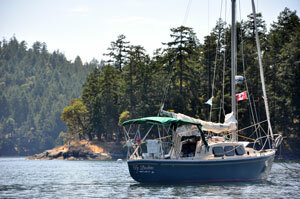 She and Chris are cruising on Navigator, a 1986 Pacific Seacraft 34. Chris reports that they're having a good time and Kellee's grin confirms it. I am the proud owner of a 1963 Cascade 29. 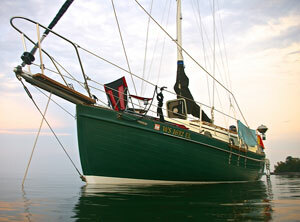 The hull was laid up in Portland, OR in 1963 which makes this her 50th Birthday. 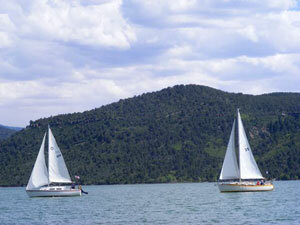 I purchased the boat in the mid 90's and sailed her first on a reservoir in Northern California, with summers in the Puget Sound and Canadian waters. 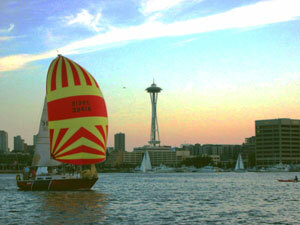 Now I live in Washington so I have access to the best sailing on the west coast on a regular basis. 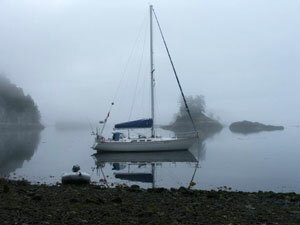 The picture is of her on a mooring ball in Montegue Harbour, Galiano Island, British Columbia, Canada. In the 18 years I've had her I have attempted to keep the nice on. The prior owner did a complete refurb. 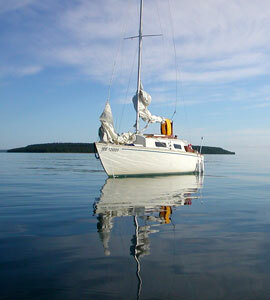 When he sold it to me it had new mast, boom, sails standing and running rigging, Brand new interior finish and cushions and the boat was freshly painted with a new Yamaha 9.9 in the lazarette and a trailer. 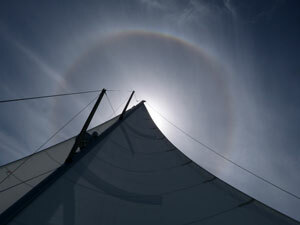 Taken on March 13, 2013 while we were sailing with friends on Charlotte Harbor in Florida. It's a solar aura - a very nice full circle one. 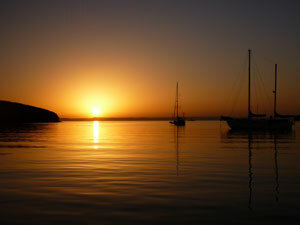 I hid the sun a bit with the masthead for this shot.' 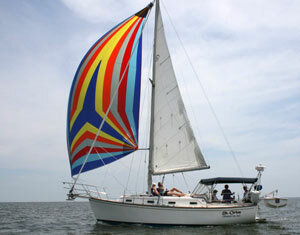 The owners are Dennis & Shirla Cesari of Punta Gorda, Florida. Their boat's name is Aurora, so somehow it's fitting. -- Tom & Sandy Wells. 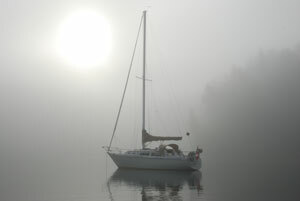 Reader Ken Pfister, whose boat photo was on the cover of our November 2003 issue, has a habit of taking drop-dead beautiful photos. This one, like his cover shot, was taken in Vancouver Island's Tod Inlet in Gowlland Tod Provincial Park near Victoria, British Columbia. Perhaps it's difficult to take a bad photo there? 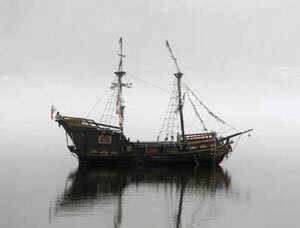 The photo is of a ' scale pirate ship that a local fellow made for fun on the local water front. Kids love to see it. 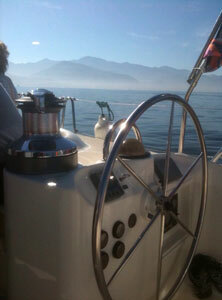 She is on the beautiful West Arm of Kootenay Lake. 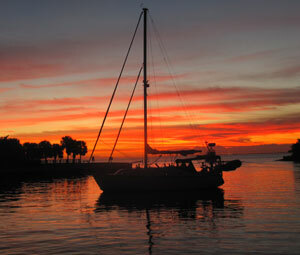 The boat's name is' Obsidian (because of the color I guess) and the owner we just call Captain Gary. 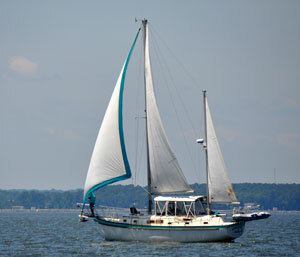 The 'Good Old Boat' is a Blackwatch cutter, Designed by Dave Autry and manufactured by his company, Bluewater Boatworks of Amarillo TX between 1976 and 1981 when his operations were closed. 'Only 81 Blackwatch Cutters, and one Gaff-rigged Blackwatch were produced. 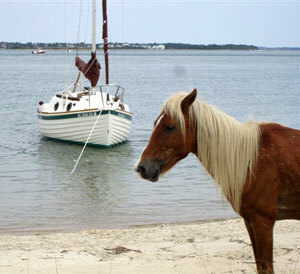 ''lil Bit is #77 and was completed in June of 1981. This is our 1988 27ft Island Packet. 'Here she's sailing on the Great South Bay, Long Island, NY. -- John Tomaso, capt., Theresa Mirabile, mate. The boat isn't named. I bought her in '09, three weeks after reading about the PS25 in Good Old Boat. I think it was the March issue. It was out of the water for 12 years. It was new in '77 in California, owned by a couple who sailed her through the Panama Canal to Key West, Florida, then lived on it for about 10 years all over the Caribbean. '' They sold her to a doctor from Long Island, NY. 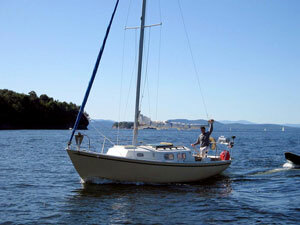 He'started a refit so he could sail to Greece, but it was taking too long so he bought a new 33-footer and sailed away. 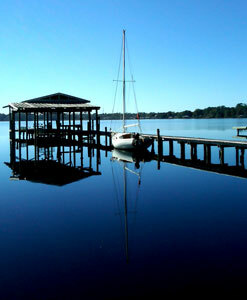 I've been restoring her, and in August of 2011 she went back in the water … for three weeks. Then the hurricane was coming so I pulled her out. 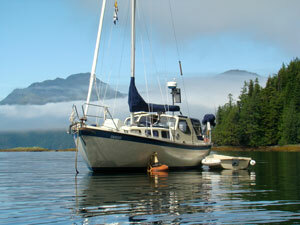 This is our beloved Shaunsea, at rest in Moore Bay at the bottom of Kingcome Inlet in the Broughton Archipelago. It's our favorite destination each summer. 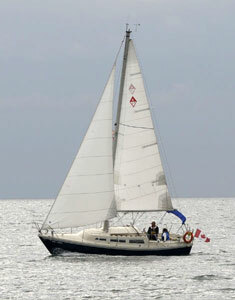 Shaunsea is a LM 27MK II. She is made in Denmark and we bought her new in Feb. of 1984. 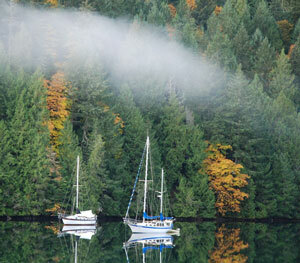 We live in Ganges on Salt Spring Island, BC. and spend our summers living on her. 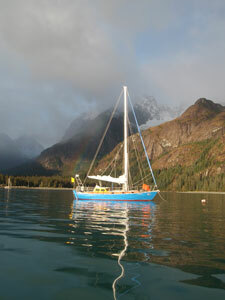 'We have been as far as Alaska, but now only go up the BC coast. 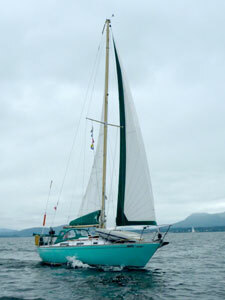 This is a 1978 C&C 34 called Solitude, owned by Erik Guttridge and Wesley Simmonds of Seattle and Orcas Island. 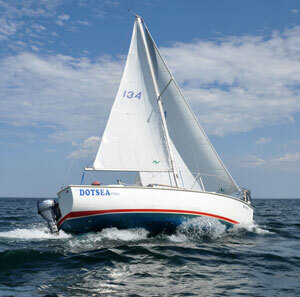 This is Baja, my dearly loved Sea Sprite 30 that my wife and I enjoy sailing around Fishers Island Sound and points beyond. 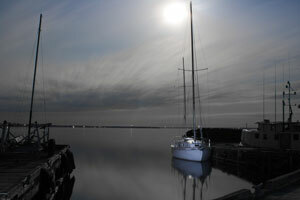 This was taken at the Great Salt Pond Harbor on Block Island. An article on the Sea Sprites would be welcomed reading, and info on the Sea Sprites is available at the Sea Sprite association website. 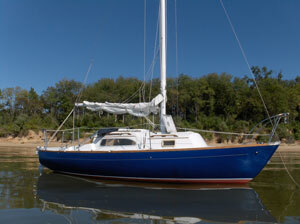 This is our 1978 Catalina 30, Hull #1187, named Perseverance. So named as a reminder of the years my wife made me chase her before she became my wife. I was reading your latest issue and read Joe Ratliff"s letter and his time in the Moonstone cove area of Catalina Island. 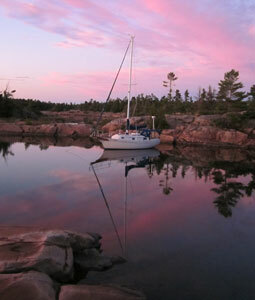 I have been sailing there and all around the island for 35+ years but never picked up a mooring in the White's Cove, Moonstone, or Hen Rock, all in the same bight. 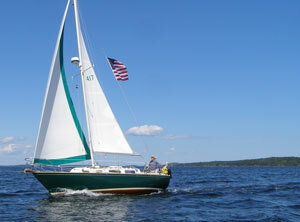 The Glenn E, a 27' Newport, Hull #88 built in 1970, named for SSgt. Glenn English, who died in Vietnam in 1970, the year the boat was made.' For his sacrifice he received the Congressional Medal of Honor.' We never met Sgt. English or his family, but thought it would be good reminder of those who sacrificed so we could enjoy sailing. I was sailing with John Kretschmer (www.yayablues.com) on a week-long Bahama's Bash out of' Ft. Lauderdale, FL to the Bahamas to Ft Lauderdale.' 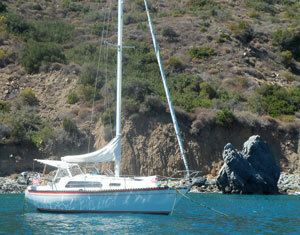 We were sailing on a chartered Fountain Pajot 40 ft catamaran due to John's boat being in Malta for the season. I restored this 1969 C&C Frigate to almost original glory over a three year period. FIVE coats of popcorn textured paint were removed to prep for primers and four finish coats of blue. All new, up-to-date electricals, plumbing, and eventually, a new Beta 25 to replace the tired Atomic 4. 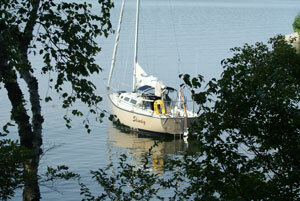 The hull and decks were rock solid; pretty good for a boat neglected. She sails nicely. I even fashioned a logo for Frigates. 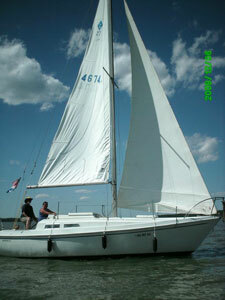 My Frigate is named "la Galouine", which is ancient, lost Acadian french for squall, or a gale. We took the last issue of Good Old Boat with us to Holland to proudly show that we, on this continent, are alive and well and have a wonderful boating community. 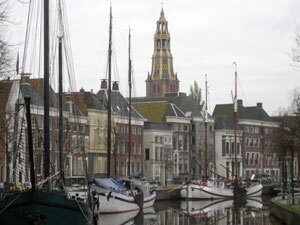 Every time we spend time in Holland I get an un-suppressible urge to obtain some kind of vessel, live on the water, and explore rivers, canals, waterways going south as far as Paris or the Rhine through Germany and all the way to the Black Sea. I guess it's just a boy's dream. Still, traffic on the waterways is fascinating, spellbinding … just the fact that it's possible to travel so far makes it so exiting. 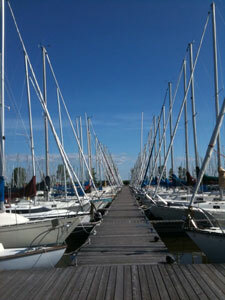 This picture is from the municipal marina at Frankfurt, MI. last June. 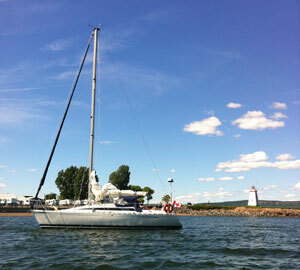 It's is a photo of the "crew" on Carpe Diem, our Catalina 445, headed for the North Channel. The black lab is Max and golden is Neuman. I love your magazine. I get five different sailing subscriptions each month and I look forward to Good Old Boat the most. I read it cover to cover. 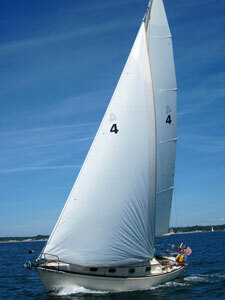 I don't race, I just enjoy sailing, the water, and boats. 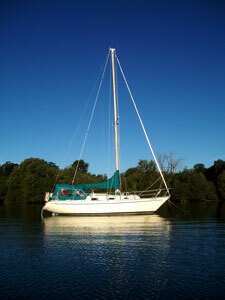 I try to find one thing in each edition I can add to my boat, to improve my sailing, or a new place to go. Your editors do a great job. -- Gary & Mindy Weichmann. Dave McFate sent this photo of his Blackwatch 20 #77 designed by Dave Autrey. 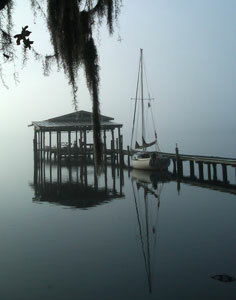 His boat, 'lil Bit, is decorating her new home just off the St. John's River south of Jacksonville, Florida. 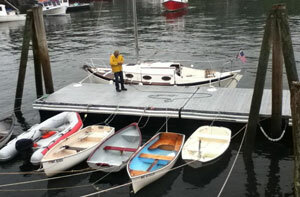 Dave is the fleet historian and is looking for owners of other Blackwatch boats. You can reach him at:'dave.mcfate@ni.com. Now that our new Good Old Boat, Zatarra, has been put to bed for the season, I'm easing the pain by browsing through my photos of her. We've owned her for just twelve months now and still marvel at our luck. 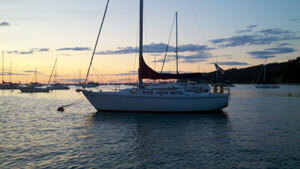 Zatarra, a Catalina C36mk1, 'was one of those "love to have someday" boats berthed in our marina. 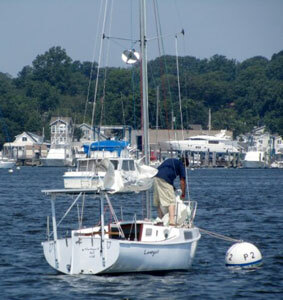 When the previous owners decided to get out of boating, we jumped at the chance to move up and haven't looked back. US No. 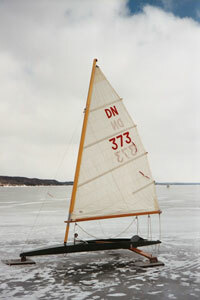 373 was built by my father in Bay City, MI in 1957. 'He and a bunch of guys built a bunch one winter in somebody's basement. 'I tagged along to "help" a couple times (at 10 years old, I suspect that the net effect of my presence wasn't helpful). 'It's likely that my boat is the only survivor. 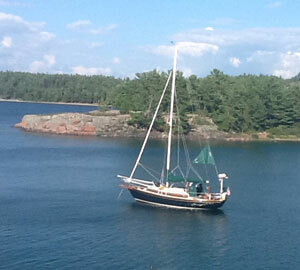 Panache in a cove at anchor on Crocker Island in the North Channel. 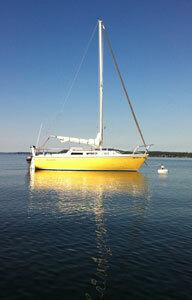 She is a Sea Sprite 30 owned by longtime reader and friend of Good Old Boat, Richard Charette. Avanti II, one very busy good old boat. 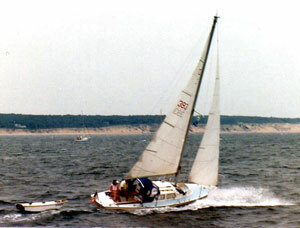 Tartan 30 #245 built in 1974. 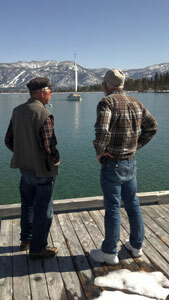 Russ Curtis writes: In 1993 my late friend, Ken Smith, and I agreed to share a boat, rather than investing in two replacements for our plywood Thunderbirds. We pooled our resources and made an offer for Avanti II. 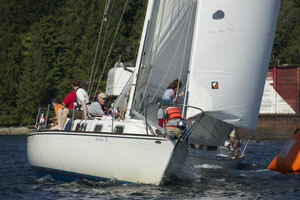 Over the past 20 years, Avanti has raced and cruised on a regular basis. 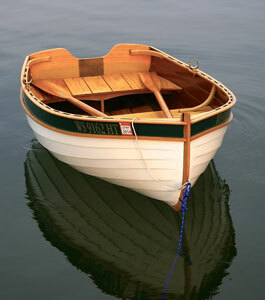 Presently, the boat is well crewed. We have about 20 people on our crew list. 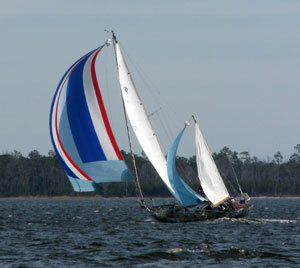 Avanti enters about 25 races every year. 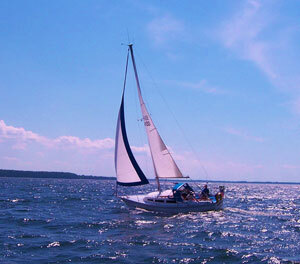 Our crew uses the boat to qualify for CYA certifications and, when qualified, have the use of the boat for cruising. 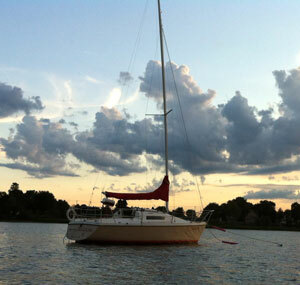 Avanti II, a good old boat, is enjoying an active life! Photo credit to Karole Ducette. I've been an avid reader of Good Old Boat for close to a decade. I have a huge collection of issues with post-it-notes marking "how to" articles with information that comes in handy when I plan boat projects. And when you own a Good Old Boat, the project list keeps growing! 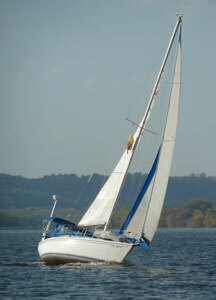 I rescued my current boat, a 1970 Irwin 23, from "dead boat row" at a local marina about three years ago for $500. Since then, I replaced the bulkhead in the cabin because of rot. And as we good old boat owners know, one project leads to another and I ended up with a total renovation of the cabin interior. I've also rebedded the chainplates where they come through the deck, installed ceiling in the cabin, rewired, sanded and varnished all wood above and below deck, and painted the hull and topsides. I still have to replace all the halyards and run the sheets aft to the cockpit so I won't have to go to the mast too often while singlehanding. In reality, I've completed maybe 25 percent of the projects, and keep thinking of more to do, thanks to Good Old Boat magazine! I have been an avid reader of Good Old Boat Magazine since becoming a sailor four years ago and really appreciate the knowledge and stories shared through those pages. 'I don't see many pics from the Maritime Provinces, however, and thought that I'd send you a few from my stomping grounds in Dalhousie, NB on Chaleur Bay. 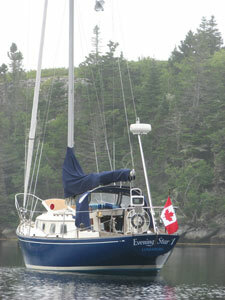 'Our boat is a 1986 Beneateau First 305 named Seaflower, and here she is anchored by the Inch Arran Point Range Front Lighthouse in Dalhousie, NB. -- Christy Arseneau. Almost a year after this photo was taken it's still the background wallpaper of my iPhone. Looking at it daily has gotten me through another long rainy Pacific Northwest winter. 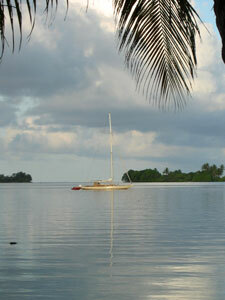 This was taken a few years ago at sunrise at Palmyra Atoll. 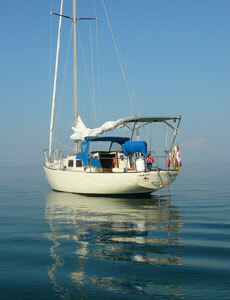 Anthea had just sailed down from Hawaii and was anchored next to us. 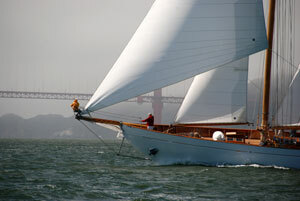 Just saw the plans for article upcoming in May for Caliber 28'.. really look forward to it. I single hand Waterstop, an old CS 27 out of Bayfield, Ont. 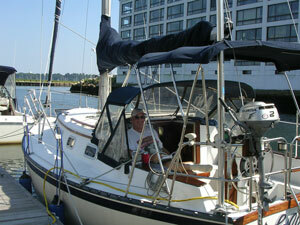 I just returned to sailing after about a 30 year absence, and I just had my 66th birthday. 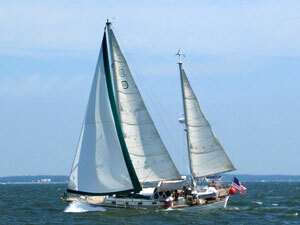 I'm a retired marathon runner and I can't run as many miles as I used to, so I took up sailing again. 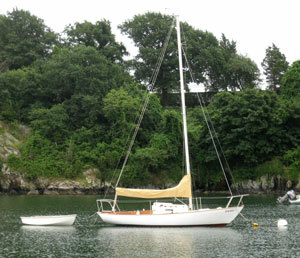 I've attached a picture of my Good Old Boat, a 1974 Sea Sprite 23 (with her Good Old Dinghy, a Dyer Dhow 9). 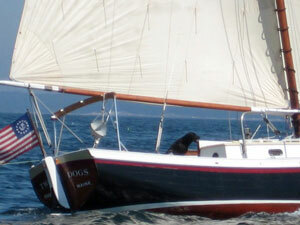 'She was built by Wickford Shipyard and is hull # 537. 'I bought her in 2009 and christened her FIREFLY because a firefly to me, is the essence of being a kid in the summer (and they are really hard to catch too!). 'She needed some TLC; I've done a major refit over the last 3 years including all rigging, hardware, pulpits, lifelines, deck-hull joint, lazarette deck rebuild, toerails, sails and more. 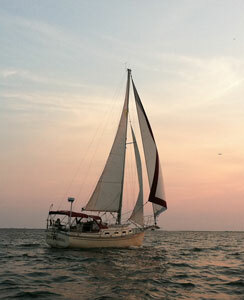 Attached is a picture of Distant Horizon,'my 1977 Columbia Payne 9.6. 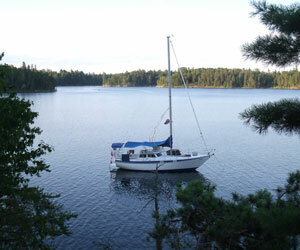 The photo was taken while at anchor in South Bay of Carleton Island in the St. Lawrence River's 1000 Islands region. 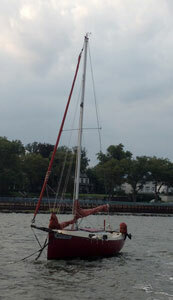 It doesn't look like it, but it was blowing a light gale (35 Kts). 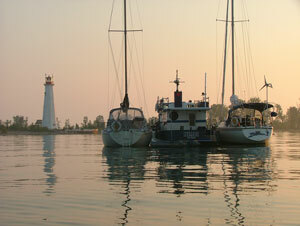 Carleton Island is the first US island from the mouth of the St. Lawrence River at Lake Ontario. I stayed at this well protected location for two days. 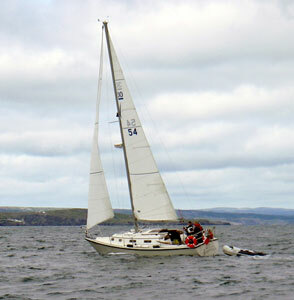 I am sending along a jpeg of my Good Old Tartan 30, Avanti II, hull #245, built in 1974.' 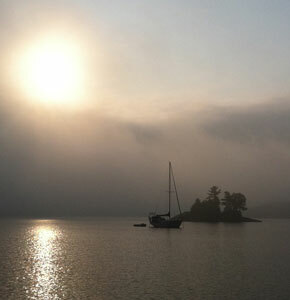 Karole Doucette took this picture as we rounded the weather mark in the Deep Cove Regatta in September 2011 and prepared for a bear-away set.' 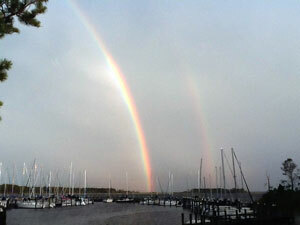 While we missed a podium finish in the regatta, the crew and I had a marvelous time. 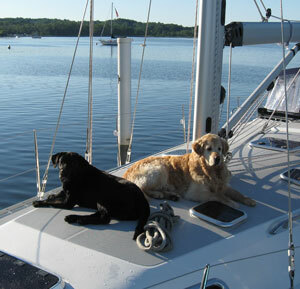 I used to have trouble getting crew and often complained about this to anyone who would listen.' About 2 years ago, I made my complaint to my Chiropractors' receptionist and she replied, dead pan, how many crew did I need????' Thanks to Cait, I now have over 25 names on my crew list, and, like all networks, it continues to grow.' Because the crew are all young professionals with many other interests and activities, I still seldom get a full compliment.' Two weeks ago, in Avanti's winds, we did get a bullet with only three on board!' 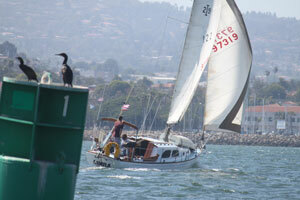 It was a short windward/leeward race of about 2 miles, so my competition could not correct over me. We have pages of photos sent to us prior to the above, but had to start a fourth page. 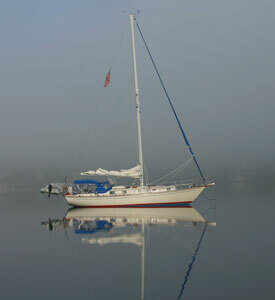 You guys are really prolific photographers, and you looooove your boats.